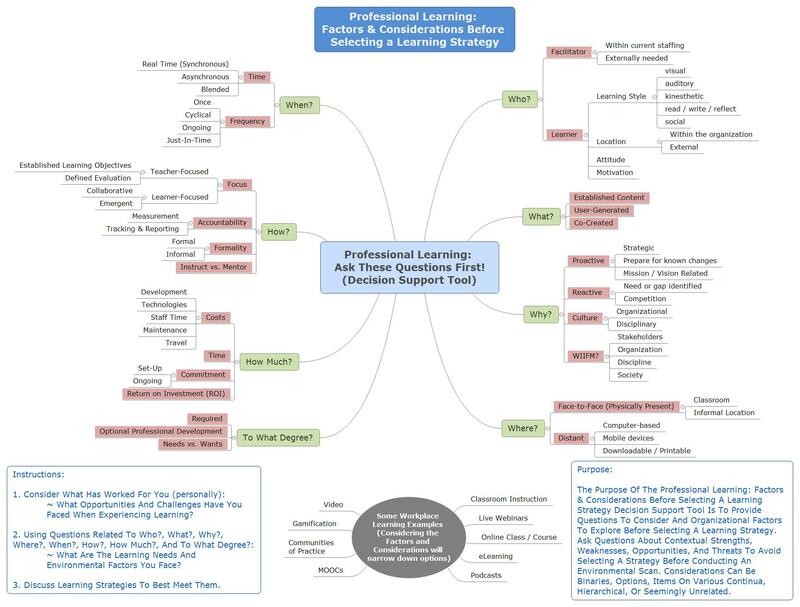 I wanted to share my revised version of the Workplace Learning: Factors & Considerations Before Selecting a Learning Strategy Decision Support Tool I developed to help frame questions and organizational considerations before selecting a learning strategy. It is easy to determine we need eLearning or a MOOC or video-based training before conducting an organizational environmental scan (related to a learner gap analysis, but different in that it considers and focuses on organizational strategies and other factors that will ultimately determine the direction learning in the workplace will take. This was created to start conversations early in the process, and while it is not intended to lead to a clear solution (far beyond what can be done via a single visualization), it does seek to demonstrate how many factors are involved in learning and development initiatives that need to be considered earlier in the process than later. No point in deciding for a wiki or a MOOC as a learning strategy without factoring-in long-term stewardship or staff buy-in. I want to thank the many people who assisted in the initial version of this, and hope that the tool will be useful to start discussions. More background about why this was created and its intention can be found at this link. Very eager to discuss this with anybody who finds it interesting or potentially useful. ** A PDF version of this file is available here. Next Next post: How Do You Write Posts?